The Multi-scaled Random Walk (MRW) Simulator simplifies exploration of MRW paths under various parameter conditions, and also includes options for elementary analysis of output data. 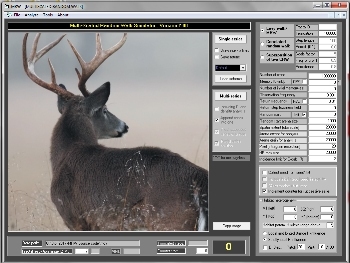 In addition to simulating MRW, the application also allows for import and analysis of series of telemetry fixes from real animals. The first distributable version of the MRW Simulator is now available! Follow this link. The MRW Simulator is a Windows-compatible desktop application. A user guide (PDF) is included. The program output contains a range of data in the form of structured text files, which may be exported to e.g. Microsoft Excel or a statistical application like R for further analysis and presentation. Click on image above to explore the interface. Hopefully this new application will engage a broader research and exploration into cognitive map-influenced space use by animals, and consequences for modeling premises and spatio-temporal population dynamics. Centre for Ecological and Evolutionary Synthesis, Dept. of Biology, University of Oslo, Norway. Real population dynamics are influenced by non-linear interactions, non-equilibrium conditions and scaling complexity from system openness. At theindividual level, tensions arise from optimizing short term tactics against longer term strategy when deciding what to do and where to go. Thus, a coherent theory for individual, population and community level processes should rest on mathematical and statistical methods which explicitly confront these issues in a manner that satisfies principles from statistical mechanics of complex systems. Instead, ecological theory is traditionally based on premises from simpler statistical mechanical theory for memory-free, scale-specific random walk and diffusion processes, while animals from many taxa generally express strategic homing, site fidelity and conspecific attraction in direct violation of primary model assumptions. The application of dynamic or statistical models that are based on non-verified assumptions about random walk and diffusion-compliant space use mechanics may produce spurious results, whether the model regards the behavior of individuals or populations. Consequently, it is important for zoological autecology to develop and test a theory which covers the continuum from memory-less to memory-influenced habitat use and movement. The Multi-scaled Random Walk (MRW) model implements cognitive map effects on individual movements by combining a scale free kind of step process (Levy walk-like) with occasional goal-oriented return steps to previously visited patches. The first of these two components may represent fitness gain for the individual by allowing for a more effective habitat exploration in comparison to a random walk and brownian motion-like space utilization (references are given in our publications). The second component may represent fitness gain for the individual from revisiting familiar locations. Such cognitive capacity also allows for intraspecific cohesion in open population systems (and hence avoiding All�e effects from otherwise non-constrained diffusion). In fact, our novel protocols to verify MRW from analysis of sets of telemetry fixes represent indirect methods to test for cognitive map influence on animal habitat use. The MRW framework is the first biophysical approach that shows this capacity. The MRW model represents a generalization of a generic random walk / Brownian motion process (including the Levy walk variant), which appears as a special case within the MRW parameter space. The MRW as a hypothesis has so far been empirically supported by studies on free-ranging sheep in Norway, black bear in the USA, red deer in Norway, root voles in Norway (not yet published), and a meta-analysis containing data from a wide range of vertebrates. Work is in progress to transform the MRW framework into a complementary spatio-temporal model for memory-influenced population dynamics.